I have been doing my own family history for many years and so after all this time talking about it and pointing out the value and fascination of doing your family history, my husband has finally been worn down and has decided that he would like to do his - HIMSELF! I had started his tree about ten years ago, but lack of interest from him resulted in a lack of enthusiasm from me and I gave up. I decided to leave it until a time when my children were old enough to be interested in it. The only thing I can remember from my previous research was finding that part of the family were living in 'The Cold Dunghills!'. I hope you find it interesting and helpful. I would be pleased to hear from anyone who would like to make any comments or suggestions or who would like to ask any questions which could possibly be included as a tutorial within this blog. First things first! You really do need to start at the beginning and, for best results, family history is always done backwards, therefore begin by making a diagram or a list of you and your immediate family. From there go back as far as you can by memory and by asking relatives about your grandparents and great-grandparents and their families, keep a record of all the information you collect and where the information came from. Collect together any documents you may have such as birth, marriage or death certificates, old family bibles and anything else relating to your ancestors which can give you information. It would be really useful to use a computer program to record all your information as this does make things much easier especially when your family members get into the hundreds. The standard software for family historians is called Gedcom (GEnealogical Data COMmunication) and it is an open file specification for exchanging genealogical data. This means that your research can easily be shared with others easily and shared on genealogical websites such as GenesReunited, Ancestry and FindMyPast. There are some open source versions of this software such as GRAMPS which you can download from the internet for free. Websites, such as those mentioned above, replicate many features from these programs which you can use online instead of having it on your own computer, however, your information would be inaccessible should you find that you can't connect to the internet. If using software, be sure to start with yourself as the 'root' person. Always input female relatives with their maiden names. Always cite your sources, in other words keep a record of where you got your information. Mark began by entering his family into genealogy software, he is using Family Historian 5 which costs about £45. He added his parents, siblings and grandparents and input all the information he knew about them (birth/marriage/death, addresses, occupations etc.). 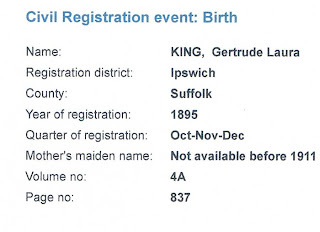 Mark already had the birth certificates of two of his grandparents, so we began with one of these, his paternal grandmother Gertrude Laura King. From the birth certificate we were able to find her parents names, when and where she was born, where her parents were living at the time of her birth, her father's occupation and her mother's maiden name. Her mother's maiden name was not clear, it appears that there are two other names as well as her married name King. 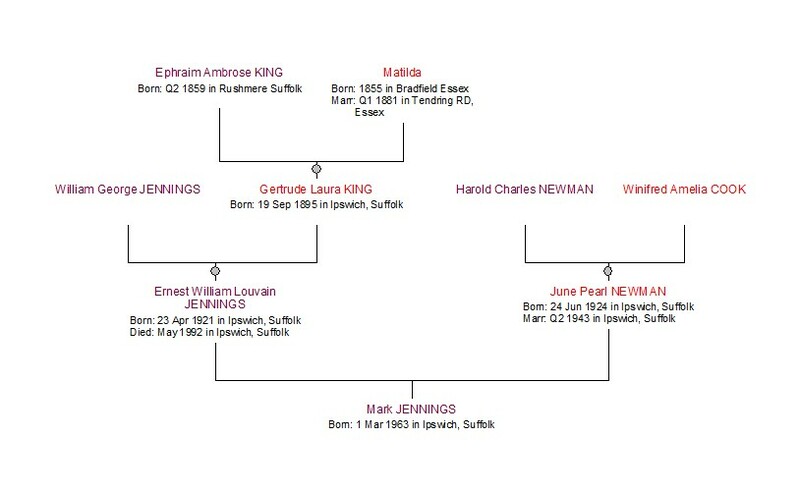 This will need investigation further down the line when we look further into Matilda's family, as Mark was keen to follow just one line to begin with, his great grandfather, Gertrude's father, Ephraim Ambrose King. A registration system for recording births, marriages and deaths was introduced in England and Wales in 1837. This system is vital to family historians and enables us to find out when and where a person was born, who their parents were to whom they married and where they married, and when and where they died. 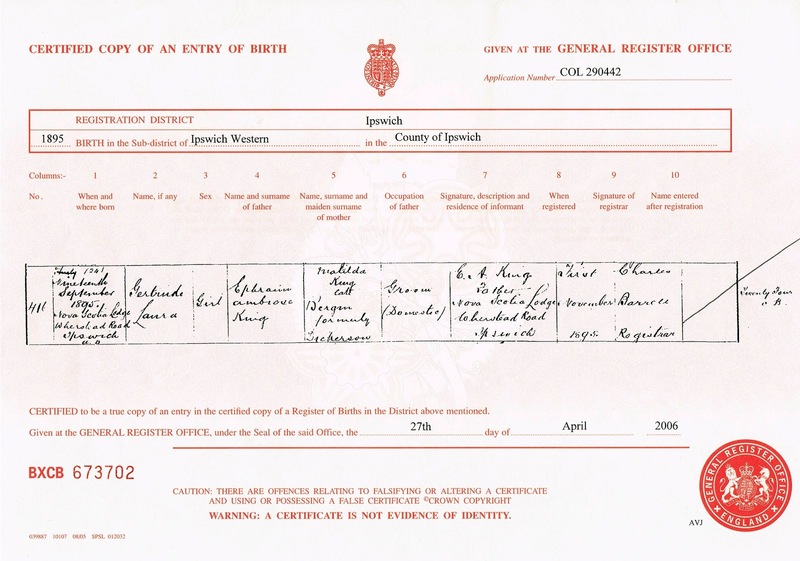 You will need to find the birth record you are searching for in the General Register Office Indexes to be able to order the birth certificate. When you search on one of the genealogy websites for a birth, a record or multiple records will appear. Choose the one which is most likely to be your ancestor and click on the record to view the index. Cross reference the information you already have in order to make the right choice when selecting the record. 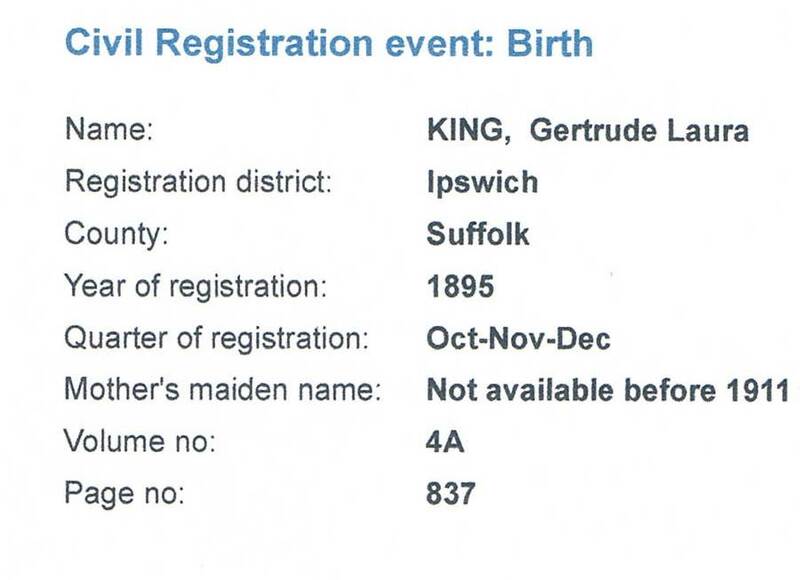 A transcript will appear which gives you the details needed to order the certificate, see below the transcription for Gertrude Laura King which enabled the above certificate to be ordered. You will see the name, the registration district, county, year, quarter, mothers maiden name (available after) the volume number and page number. The registration district is usually named after the nearest town or an area so do not take this information too literally. Indexes were kept on a quarterly basis so the date of birth could be within that quarter or before. The volume also relates to the area as Registration districts were bound together in volumes. The page number is where the entry may be found in the volume. You can order birth, marriage and death certificates through most of the genealogy websites or through this link http://www.gro.gov.uk/gro/content/ directly from the General Register Office. use the information found from the index to fill in the online order form. All certificates are currently priced at £9.25. 1. Collect as much information as possible. 2. Ask relatives what they know. 3. Don't believe everything you are told, however, there may be some truth to it! 4. Use software if possible - it makes your research easier in the long run. 5. Always start at the end - go backwards! 6. Use civil registration certificates (birth/marriage/death) if you have them, to gain more information about your ancestors. You may want to consider ordering them if not. 7. Be sure to add all the information any new source gives you to your genealogy software (a birth certificate gives you more then date of birth and parents names). 8. Back up your research. 9. Most important of all - KEEP GOOD RECORDS!